The 3-star Opera Deauville hotel is located in a traditional building in the heart of the thriving and touristic Paris, close to the major department stores, the Garnier Opera House, the Grands Boulevards and many more renowned landmarks of the French capital. The hotel features 30 air-conditioned rooms with all modern comfort such as LCD TV, free wireless internet. A friendly and attentive personnel will be at your service and pleased to help you throughout your stay in Paris. 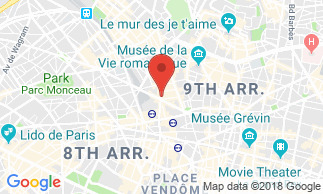 The hotel is situated in the 9th district of Paris. Its location is ideal to visit Paris on foot or to use efficient public transportation near the hotel to explore the French capital. Buffet breakfast served from 7 to 10am in a vaulted room with stones. Not included in the rates: 12 euros per person. Fresh fruit salad and juices, pastries/croissants, yogurt, cheese, ham, cereals, boiled eggs. Room service from 645 to 10am without surcharge. City tax not included in the rates: 1.88 euros per person and per day.